Welcome to Las Vegas | Cosa Mi Metto??? Welcome to the sin city!!!! Las Vegas is really amazing, every hotel surprise you with different setting, architecture and attraction, I want to visit them all!!! Benvenuti nella citta del peccato!!! Las Vegas è davvero sorprendente, ogni hotel ti sorprende con una diversa ambientazione, architettura e attrazione, voglio visitarli tutti!!! wow very hot. Love your bikini and wedges!!! You guys should go see Cirque du Soleil. che bello!!! sono stata anche io a las vegas 3 anni fa, abbiamo alloggiato al planet hollywood!! Foto favolose e molto carino anche il tuo look! Che bello!!!!! !e che bel vestito. grazie per la visita .....anch'io guardo sempre i tuoi post anche se non sempre commento. Siete giovani e belli , e anche un po' privilegiati....divertitevi !!! stupenda LV!!! spero di andarci un giorno! bellissimo il tuo vestito. che viaggio da sogno! Sono stata a las vegas quattro volte e a parte il caldo ferocisssimo mi sono sempre divertita tanto! Che bella che sei! E che figata quella piscina! you have brautiful pictures too. we can follow each other if you like? The happy couple! You are perfectly highlighted this delightful dress! Great! I like your dress and wedges! il vestito da sera è troppo bello!! Fantastic photos! Looks like you have a great time! Your dress is amazing! adoro l'ultimo look, il vestito è stupendo! Amazing photos and outfit dear...You look gorgeous! Looks amazing! Love your lace dress too. WOW!!!!!!! You and BF look amazing!!! Love the white dress, you look like a DOLL!!! Las Vegas must be a lifetime experience!! I was there this summer too. It was amazing. 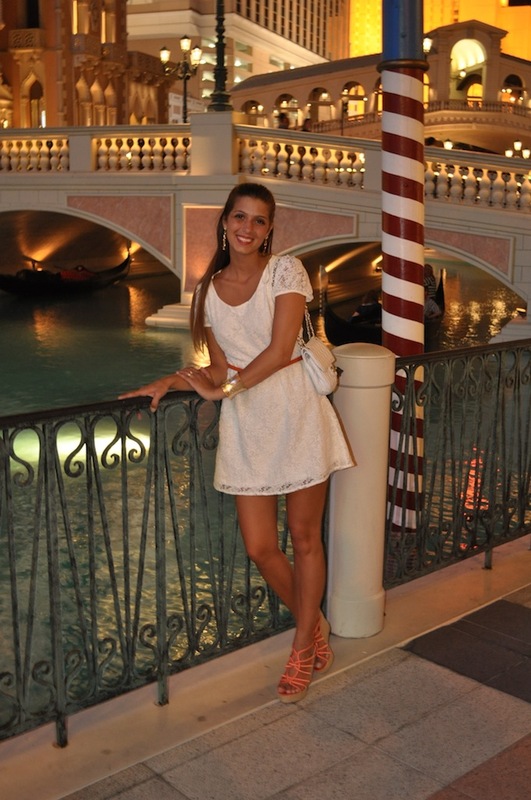 I loved the venetian the best. Check my Vegas Vegas post. i lettini in acqua sono fantastici!!!! Great photos! I love it! che hotel bellissimo! dev'essere stato proprio un bel viaggio, beata te! fotografie meravigliose! Viaggio stupendo direi! That pool is great! And the pictures to ^^. It's so lovely that i've been there to. Love you're clothes! What a pretty little dress and such a nice vacatio, too! Las Vegas is a very impressiv city. I like it very much. But I haven't been ther for 16 years now. There a lot auf new hotels an attractions to visit now. P.S. We depart to Kos (Greece) tomorrow morning (2.30h) to spend our summer holiday there. I'm a little bit exited now. Ciao carissima e grazie per essere passata nel mio blog! Che posti stupendi mammamia, quella piscina poi è favolosaaaaaaa! Certo ci siamo divertite cara!! Anche te sembra!! Sei bella come sempre!! adorable pics dear!love this dresson you! stai molto bene con l'abitino bianco! e l'hotel è meraviglioso..che piscina!!! Ciao Bella! u were in the States, im so jealous! this hotel looks awesome and very luxurious! Please check out my blog when you get a chance! Ah! I was in Vegas recently.. It is always a lot of fun! Except when you see the girls all drunk at the end of the night passed out on the streets.. Ha, I hope that did not happen to you! Looking fabulous and loved every single picture! and I'm in love with your shoes, they are stunning! I've been following you now, so it would be great if you would follow me back! Bellissime foto e adoro il tuo outfit! Belle foto fabry! !adoro gli orecchini! what can I say about your style! 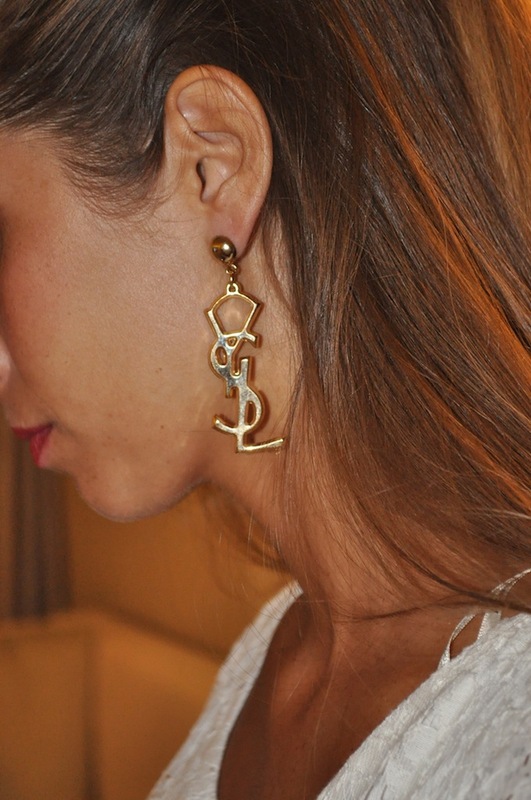 You are as stylish as a model!Love your YSL earrings and the white chanel bag! :) I'm your follower and you deserve all attention!! thank you so much for the comment on my blog ! Love yours !! Las Vegas seems awesome !!!! I love your lace dress!! Wauw! It looks beyond amazing. Really want to go there to! seguimi anche tu se ti fa piacere. Hi, thanks a lot for nice comment on my blog. I immediately checked your blog and you are very nice and same zodiac as me! thank your for your comment! !you have a nice blog and im following now! kisses from prague and enjoy your day! WOW las vegas is an amazing place, i really wanna go sometime! i love your dress, it's so beautiful! I like your blog!, following! Questo vestito lo trovo ADORABILE,sai da quant'è che ne voglio uno? :) E Las Vegas...bhè...è Las Vegas!! Sono la tua follower n.873! And what a wonderful place huh? I loved visiting your corner, and I loved your comment. Come back more often, I'll always be here! I loved your blog also know .. very cool and your pictures are beautiful in Vegas, amazing place huh? I am following here and I'll be very happy to have her among my dearest. Follow me back?? amazing pictures! everything look so great & amazing! i want to go to vegas soon! Great photos and you look fantastic! wow, i really want to visit las vegas one day, great place for party and fun, lovely pictures. :) Like your blog! Feel free to visit my blog, we can follow each other! I love the pictures are beautiful !!!!! Lovely photos! I am a new follower! Very nice dress and beautiful photos !